Version 1.2 is out now, adding wobbliness to your box corners! 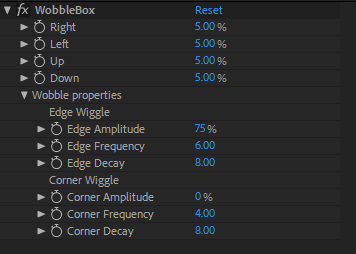 WobbleBox is a Shape Layer preset that creates a box rig that reacts in a jelly-like way to your animation. Created with Joysticks 'n Sliders and inertia expressions. WobbleBox will ONLY work in After Effects CC2018 and later. Slider controls animate your right, left, up,and down sides of your box. You can also customize the amplitude, frequency, and decay of your wobbly sides. Fixed expressions to work with the new CC2019 Expression engine.